Rhody Life: Christmas Without a Tree? No Problem! This year, we will not be getting a Christmas Tree. And it's not because Dylan was fired from lighting it last year, which he was, by the way. It's because with the chance that we will be having our floors refinished this month, setting up a Christmas Tree would be silly when it would just need to be taken down or moved somewhere else. So, I'm here to talk with you about how you can decorate for Christmas without setting up a Christmas Tree. Before we lived in a house, Dylan and I only decorated minimally and never had a tree in any of our apartments. So for those of you who are also living in spaces where you either don't have a tree, don't want a tree, or legally can't have a tree, here are some great ideas on how you can spruce up your home for the holidays - no pun intended! 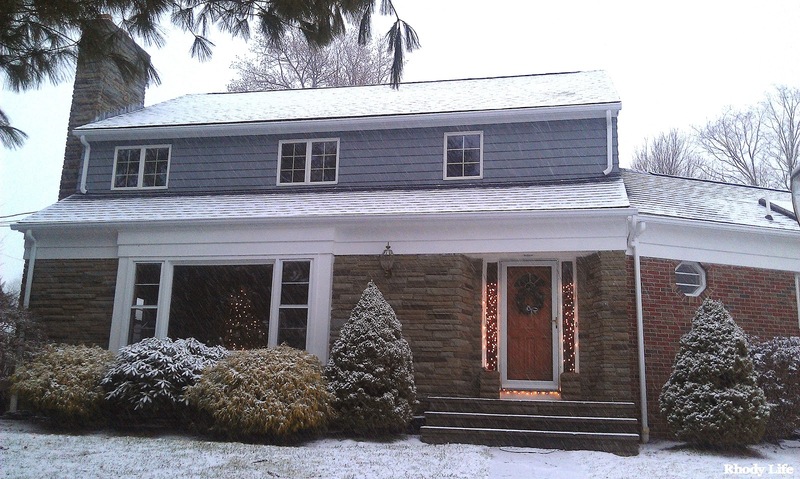 You can buy an outdoor spotlight to illuminate your front door from any hardware store. The spotlight can just be stuck in the lawn and an outdoor extension cord could be run to provide power. A spotlight would be perfect if you were going to put a wreath on your front door. You could also use string lights to go around your front door, bringing the attention to that one spot without going overboard and lighting every edge of your home in string lights. If you don't want to line your font door completely, you could always just light the sidelights. Last year, I used some Smycka sticks that I purchased from IKEA and put half of the bundle on each side of my front door, and strung lights through them. I loved the way that this looked, and can't wait to set up this part of my decor again when the rain stops. Make or buy a wreath to hang on your door using 3M Command Strips. I made one a few years ago out of coffee filters, and it is so seasonal. It's big, white, and fluffy, and I love it. This year, I have it on my front door and it really pops against the purple. While this may not be the best wreath for all of you, I am able to use it here because the storm door protects it from the rain and snow. If you don't have a storm door for protection, go with a wreath that is made of something other than coffee filters. You could use ornaments, or even go with a beautiful evergreen wreath that you can add a ribbon or some other accessories to. Light your Entryway or Foliage. 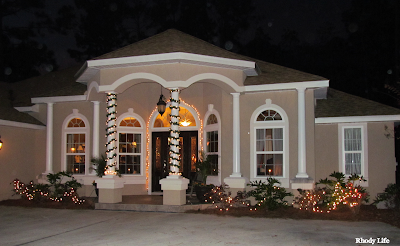 If you have a railing or posts in front of your home, get some rope lighting and light it up! The addition of even one string of rope lights could help bring the holidays to your space! If you don't have any railings or posts, you could also use net lighting and go over some of the larger bushes in front of your home. Rope lighting can also be wrapped around the trunks of some of the trees in front of your home. 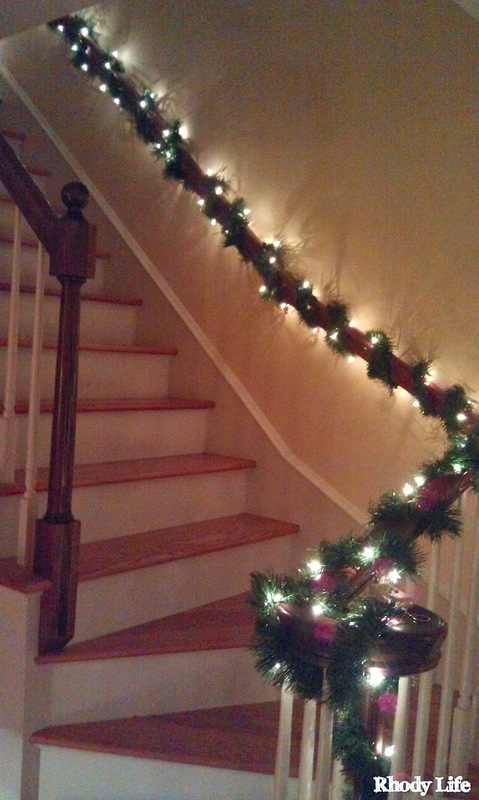 Garland and lights for your Staircase. If you have a staircase in your home, grab some garland, real or fake, and wrap it around the banister or railings. This welcoming touch can help make guests feel that your entire home is open and cheerful. Adding some lights makes it look really pretty, and can even act as a nightlight for those little ones who may need to go downstairs in the middle of the night. Do you have a gallery wall going up your stairs? Take some holiday themed wrapping paper and place a cutout over a few of the pictures that you have hanging in your space to bring that little bit of holidays into your every-day decor. 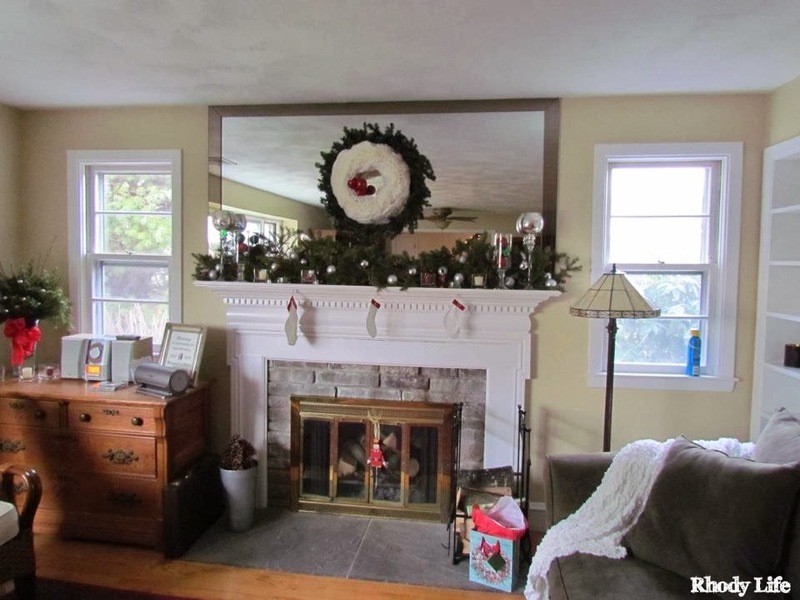 There's nothing better than decorating your fireplace or mantle around Christmastime. If you're looking to bring in some holiday cheer, put a little greenery on your mantle - real or fake. In fact, if you're looking for some real greens, take a trip to a tree farm and take some of the clippings from the farm - they typically won't charge you for these, and while you may not be picking out a tree to bring home, you can still enjoy being outside at the tree farm. Add some height to your mantle using pedestals with candles or tall tapered candles. If you have any goblets, use those, and if you'd like, you could even get some lighted branches and use some of those to add some light on top. You may also want to add a wreath to the space above your mantle, or have it rest on the mantle if you are unable to hang it on the wall. Lastly, if you have a mirror that you can put on your mantle, doing this will really help to make the space brighter and seem bigger, plus, if you add lights or candles to your mantle, the reflection of them in the mirror will look wonderful! If you're not using your fireplace for an actual fire, place a beautiful vase of greens and berries in front, or place some battery-operated candles inside to give the illusion of a fire. Finally, and probably the most popular way to decorate your mantle and fireplace for Christmas, is to hang stockings. If you don't have any stockings, make your own. There are so many different patterns out there for sewing them and some for knitting and crocheting too, and these will not take long to make. Hang them on your mantle using cup hooks or by using some of the stocking hangers that rest on top of the mantle so that you are not putting hooks or nails into your fireplace. What other ideas do you have on how to decorate your home for Christmas without having a tree? Which of these ideas do you like the best? If you don't celebrate Christmas, what do you celebrate and how do you decorate for the season?